A new Xiaomi device codenamed “Chiron” has been spotted on the GFXBench website. The benchmark listing has revealed some of the expected specifications of the upcoming smartphone. Interestingly, the listing shows most of the same specs as the recently launched Mi Mix 2. The phone is packed with premium features like Snapdragon 835 and 6GB RAM. Based on the specs we can expect the Xiaomi Chiron to be the next Xiaomi flagship and it may be dubbed as Mi Note 3 or even Mi 6 Plus which was earlier rumored to be launched with Xiaomi Mi 6. As per the listing on GFXBench, the Xiaomi Chiron has a 5.6 inch display that has full HD (1920×1080 pixels) resolution. Moreover, it comes with a widescreen aspect ratio of 16.5:9 and 5 finger gesture support. The Chiron will run on Android 7.1.1 Nougat with MIUI 9 on top. The Xiaomi Chiron comes with an octa-core Qualcomm Snapdragon 835 chipset with Adreno 540 GPU. Memory wise it is packed with 6GB of RAM and a whopping 256GB of internal storage. However, there is no information about its battery or expandable memory. Further, the Xiaomi phone is listed with a 12MP autofocus camera and an LED flash in its rear panel. It is not quite clear if the device will come with single or dual cameras. There is a 5MP camera on its front for selfies. 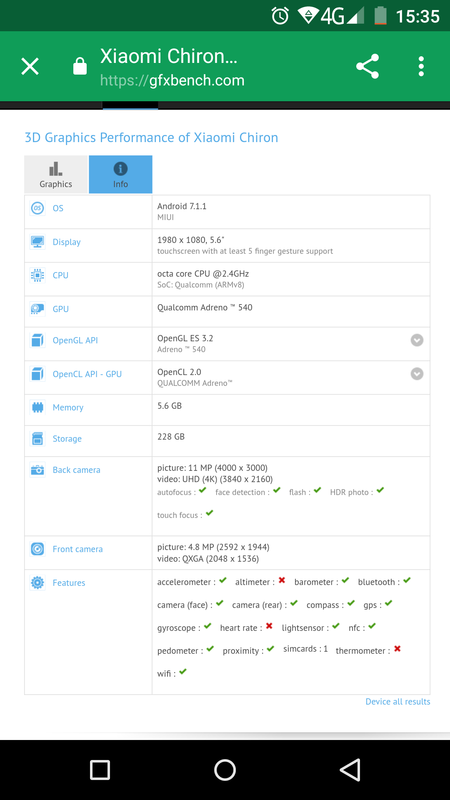 Apart from that, the GFX listing shows that the device has connectivity features like Bluetooth, GPS, NFC, and Wi-Fi. Also, the device has an accelerometer, gyroscope, light sensor and proximity sensor as well. Xiaomi had recently launched the second-generation Mi MIX 2 with almost similar specifications but with a 5.99 inch full HD+ display with 18:9 aspect ratio. So, we can also assume the new device to be a variant of the Mi MIX 2 with a smaller screen, but having similar features.